SGBox Singapore Math Curriculum For Pre-Kindergarten / Nursery (Beginner) is a rigorous, comprehensive, integrated and modular Singapore Math curriculum package designed to provide your child with an intensive, thorough and first class math education, so as to ensure they get a huge head start in math over their peers. 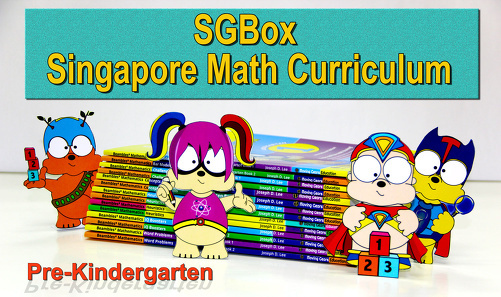 SGBox Singapore Math Curriculum For Pre-Kindergarten / Nursery (Beginner) consists of a carefully selected variety of excellent Singapore Math books that will maximise your child’s learning and mastery of math and help them build up a solid foundation in math. With this Singapore Math package, your child will master essential mathematical concepts and skills, math problem solving skills and math critical thinking skills; develop confidence in solving fundamental math questions; and grow to love math.